With optional pay-per-click marketing! Set your bid and budget to add quality job seeker registrations. remains, but our marketing automation does the hard work for you. The #1 recruiting event challenge that we hear from most recruiters is promotion--getting the event in front of the right audience. 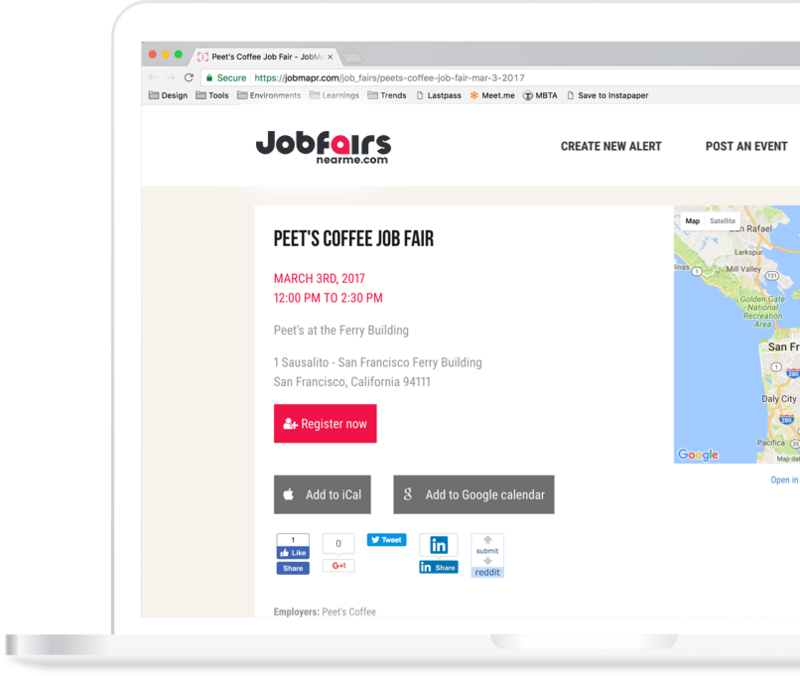 Elevate the visibility of your recruiting events via a network of top online recruiting and event brands. Use our company pages to power your company’s hiring event calendar. Are you ready to rock your next hiring event? Create you page, set your budget, and let us do the marketing. When you are logged in to JobFairsNearMe.com, please visit My Profile > My Events. This will open a list of all of your events. When people register, that count is displayed as a link to access those details. When you place your order, your credit card will be pre-authorized for the amount of your campaign budget. When your campaign ends (on the event end date), your payment will be processed. Charges will equal the cost of the actual registrations or your maximum budget, whichever is lower. will actually attend my event? Conversion to attendance varies by the event, the length of the promotion, the time of year, and even based on the weather and traffic that day. Attendance is highest for those employers that reach out in advance of the event to each attendee with a personal note. In addition to JobFairsNearMe's automated registrant email confirmation and 24-hour reminder messages, we encourage our customers to make the most of their events by reviewing each registrant prior to the big day, and emailing or calling them, especially the most promising job seekers.